Deontay Wilder is days away from his toughest WBC world title defense, as he headlines his first Pay Per View against undefeated Tyson Fury. Even with the prospect of the hard-hitting Fury, the shadow of Anthony Joshua hangs above Wilder and the title fight at Staples Center. Joshua and Wilder have been embroiled in a very public negotiation since early 2018, with both sides leveling blame towards one another. 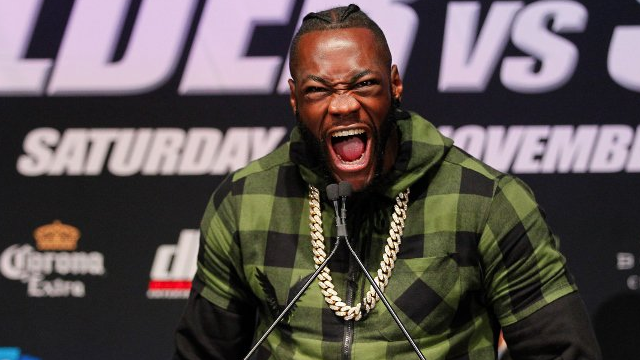 “I told him, you’re going to regret not taking $50 million,” Wilder said of his initial offer to Joshua via his adviser Al Haymon and Showtime. “He said he has a team and they conduct business in a certain way, and I said, ‘say no more’. I’ve said what I’ve said, he’s said what he’s said, and he’s going to see. “The money, the megabucks, is always in America. Ninety-thousand might come and see him fight but that don’t equal the money. He missed out. He can’t make as much money in the UK as he could in this fight. He’s misguided, listening to people who don’t understand the American market. Joshua claims he will not watch the fight between Wilder and Fury on December 1st, but per his promoter Eddie Hearn, negotiations are open for an April unification fight at Wembley Stadium if Wilder wins.